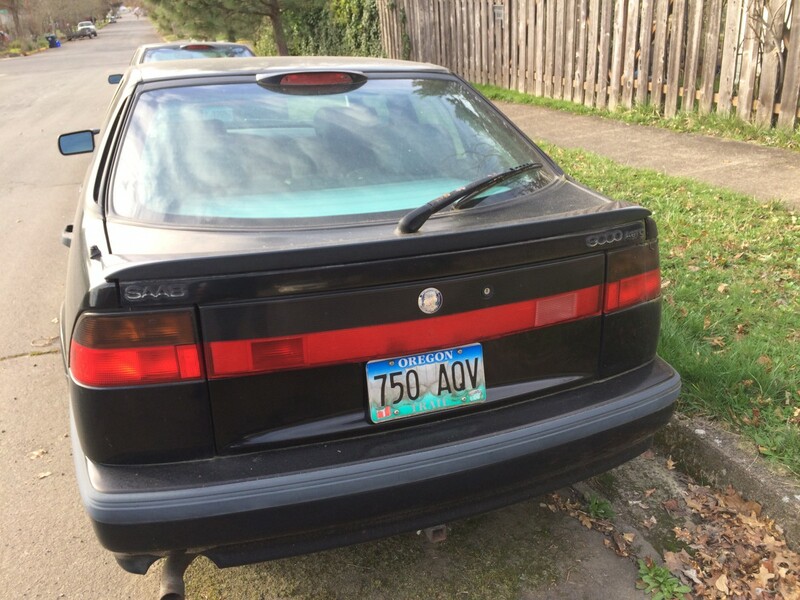 The Saab 9000 is another car that’s quickly becoming rare on the streets. Well, here’s two of them, but then lovers of old cars often double up, or more. Safety in numbers, or something like that. The rearmost one is a 1995 9000 Aero. It was the top performance model at the time, with a 225hp turbo 2.3 l four, and was a brisk car for the times, with a 0-100kmh (0-61mph) time of 6.7 seconds and a top speed regulated to 155 mph. And this one’s a 1995 9000 CSE. (Thank you, Carfax). The CSE also used the full-pressure turbo, but here making 200hp from its 2.3 L four. Or maybe 220hp. It gets a bit confusing keeping all the many variations of these models and engines straight, even when relying on source material. 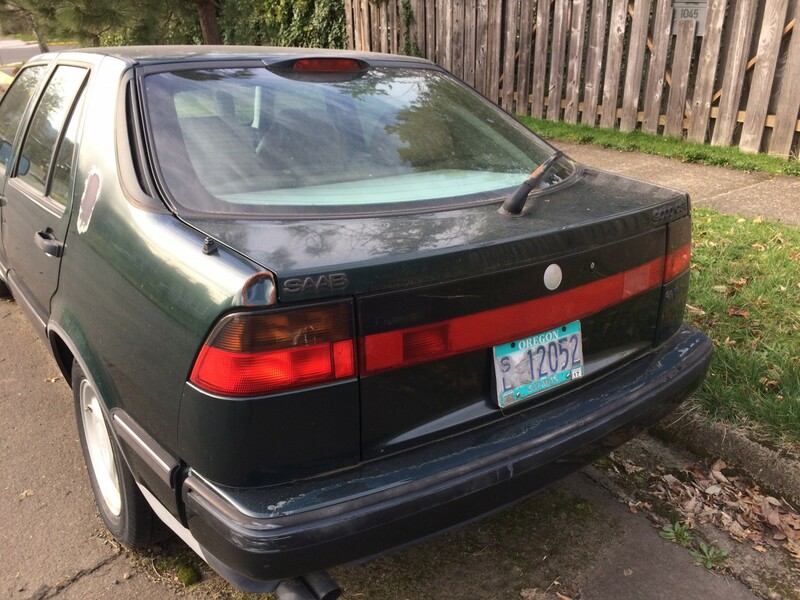 The point is, this is a serious Saab 9000 lover. 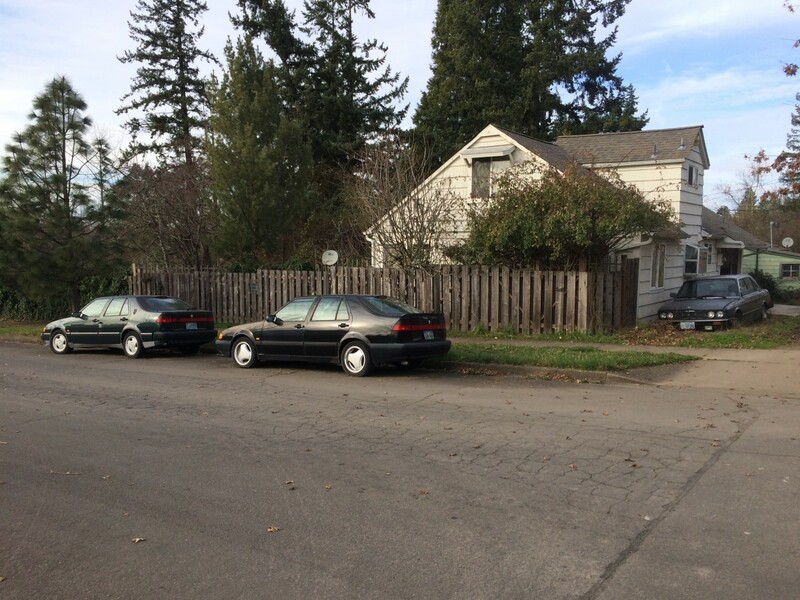 And there’s a forlorn BMW 5 Series sitting in the side yard. Hopefully the Saabs will escape that fate. Paul: I do so very much enjoy your “Street Scenes” articles. Having owned a ’93 9000 CSE, the Aero was the Holy Grail of Saabs for me back in the late 90’s. I’d still love to have one, as my 9000 was my favorite car of all time, but I’m afraid that ship has sailed, as any remaining examples that aren’t completely clapped out are held in the loving hands of enthusiasts who know what they have and won’t part with them for less than top (and sometimes ridiculous) prices. I seem to recall that in the final 2 years of production the Aero (badged as such) wasn’t offered in the US, but CSE’s were essentially equipped with the Aero running gear. In any event, I have nothing but the fondest memories of my 9000. It was a sad day when at 330,000 miles I had to give in and let it go. It was solid, comfortable, handled amazingly, was a versatile hauler…I can’t think of too much it didn’t do well. I have 1996 9000 Aero project that was sandwiched in an accident. Also my favorite car of all time. It gets even more confusing because the engines in at least the Aero were de-tuned to 205(?) with an automatic transmission. I always thought the 9000 was an attractive car and figured that being a little more mainstream would bring a big jump in popularity. Nope. But those who love these really love them, like the guy I know who used to sell Saabs and who picked one of these (with a turbo) up really cheap on a trade-in. Last I knew he was still enjoying it. 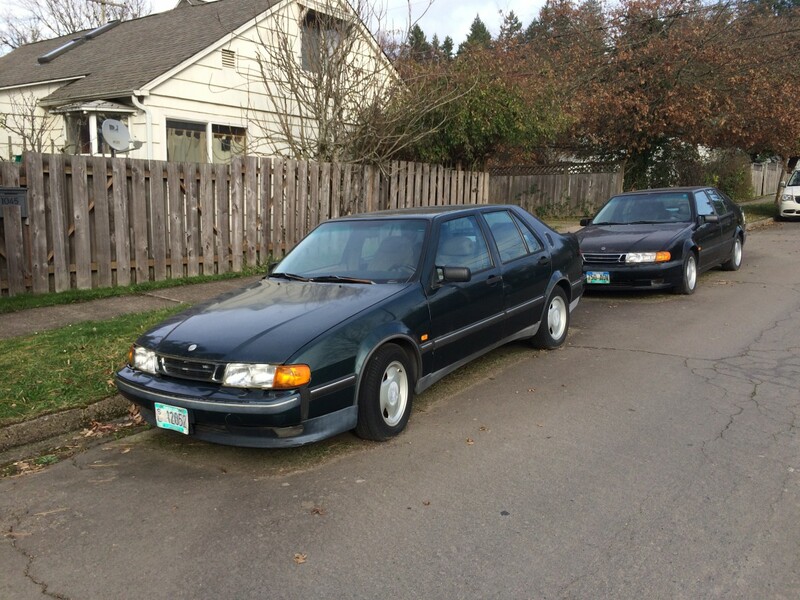 I kind of wanted a Saab 9000 for a while when I was a teenager. I don’t entirely remember why; I think I just fell for their ad campaign since I didn’t really know all that much else about them at the time. When I was a young man I really wanted one of these; they always seemed just outside of the mainstream just enough to appeal to my individual nature. As an adult, i’ve driven a 1993 Saab 900 and a 2006 9-2. 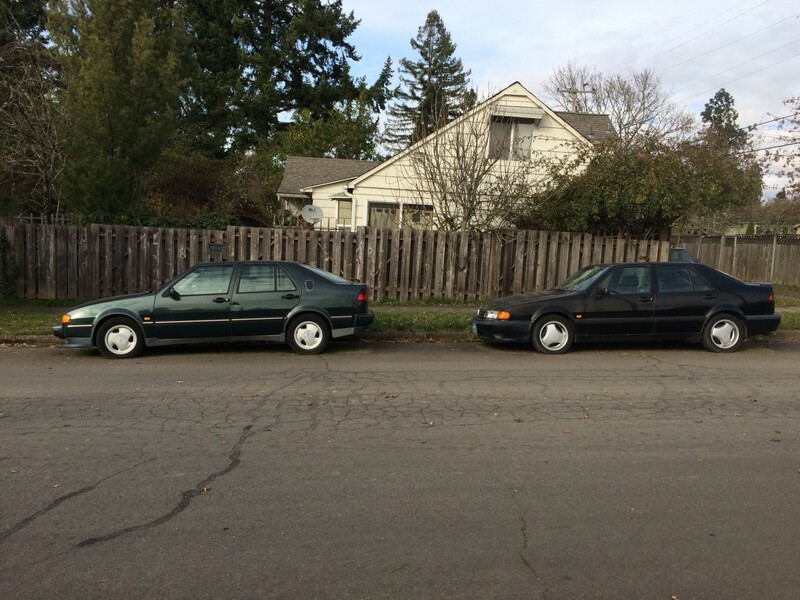 These cars, particularly my repair-prone 900, effectively slaked my Saab thirst for life. The rear car has the super aero wheels. Those are almost unobtanium with the 5×110 PCD. And they look gorgeous, regardless of the Saab model. It’s safety in numbers for sure. It is well known that they don’t both belong to that house. They just gather there overnight because it’s public and well-lit, to deter packs of marauding Eugene Volvo 240’s. The Volvos didn’t get past the late ’60’s for schooling and development, don’t have a turbo or even independent suspension, are jealous, and know that the Saabs family is dead. It’s a tough old world out there. The discarded carcass of that poor BMW is proof, as if it were needed. Ah, now those 9000’s don’t feature IRS too; they came with a live axle unlike their Fiat, Lancia and Alfa brothers.